The pain that still more afflicts these holy souls, the spouses of Jesus, is the thought of having, during life, displeased by their sins that God Whom they so ardently love. Some penitents have felt so much pain and sorrow in thinking of having, by their sins, offended so good a God, that they died of grief. The souls in Purgatory understand far better than we do, the claims that God has to our love; they love Him with all their strength. Hence, at the thought of having offended Him during life, they experience pain that surpasses all other pain. O my God! because Thou art infinite goodness, I am sorry with my whole heart for having offended Thee. I promise to die rather than ever offend Thee more. Give me holy perseverance; have pity on me, and have pity on those holy souls that burn in the cleansing fire, and love Thee with all their hearts. 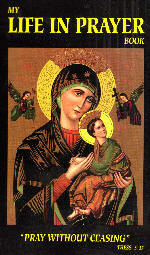 O Mary, Mother of God, assist them by thy powerful prayers.